Even the best of human love is filled with self-seeking. To work to increase our love for God and for our fellow man (and the two must go hand in hand), this is a lifetime job. We are never going to be finished. Love and ever more love is the only solution to every problem that comes up. If we love each other enough, we will bear each other's faults and burdens. If we love enough, we are going to light that fire in the hearts of others. And it is love that will burn out the sins and hatreds that sadden us. It is love that will make us want to do great things for each other. No sacrifice and no suffering will then seem too much. Yes, I see only too clearly how bad people are. I wish I did not see it so. It is my own sins that give me such clarity. If I did not bear the scars of so many sins to dim my sight and dull my capacity for love and joy, then I would see Christ more clearly in you all. 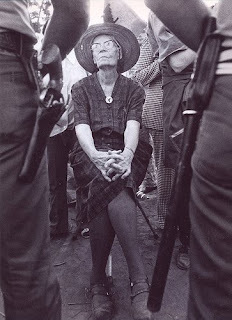 Given my recent immersion into the life and times of Dorothy Day, I thought I'd take a post to recommend a good starting place for those wanting to become more acquainted with her. Specifically, after having looked at a few biographies of Day (outside of her own autobiography The Long Loneliness) let me recommend Jim Forest's All Is Grace: A Biography of Dorothy Day. Forest's biography isn't magisterial, lyrical, or definitive. But it is well-done, short, and written by someone who knew and worked with Dorothy. What really recommends Forest's biography is that is it packed full of pictures and quotations from Dorothy Day. I found the cumulative effect of pictures, biography, and selections of Day's own words to be quite powerful. In short, if you want to get a start on the life and thought of Dorothy Day I'd begin with All is Grace and Selected Writings. What a picture! I haven't read much about Dorothy Day, but I do like her description of love, specifically that the best of human love is filled with self-seeking and that it is a lifetime job. I think part of our cultural problem when it comes to love is that we tend to think of it primarily as an emotion, whereas Day seems to talk about it more as a work. "To work to increase our love for God and our fellow man..." That, I think, is part of what Jesus meant when he said to love your enemies and pray for those who persecute you. It's not so much about good feelings, but working and praying for the best - to bear each other's faults and burdens. Thanks for the book and movie recommendations, too. That is a wonderful quote. I may have to steal it. For many years now I have been more than a little in love with this amazing and inspirational woman. In a world that so often seems rather devoid of true role-models for young and old alike, she will long stand as a beacon of integrity, passion and Christian ACTION. I remember that when I first read The Long Loneliness I thought of her as a friend and someone I wish I could actually know and engage with. There are not many writers that evoke this feeling. Thank you Richard for bringing her to us all afresh - it'll be a long, long time before this woman is either irrelevant or forgotten.